Grand kings of the forests across all the northern parts of the world, Beech Trees are usually not seen in gardens in the natural form, but instead in forms with gorgeous purple or pink leaves, often with weeping branches, or as narrow, upright forms. They are captivating and unique specimens, adding something special to any garden, and they are ideal choices to mark special occasions, or to plant just because you love beautiful and interesting trees. They are not among the fastest-growing trees for gardens, but the little extra time they take is well worth waiting for, as these trees only become better and better as they mature. Additionally, they often live long lives, so you are also planting for the future. With their smooth gray bark, delicate branching and simple leaves, there is something very basic about a Beech Tree, that simply says ‘tree’ directly to our hearts. Europeans in particular love their beech trees, from Scandinavia to England and France. The early colonists loved it so much it was one of the first trees they brought with them, around 1750, and it has been loved in North America ever since. Although recognized as different species, the various beech trees from around the world are very similar in appearance. Considered to be one of the best woods for burning, the aroma of beech smoke finds its way into German smoked beers, hams and cheeses. Forest trees were often cut down regularly for firewood, called ‘coppicing’, and they quickly re-sprout into multi-stemmed trees. Pieces of beech wood are even used to make Budweiser beer, improving the environment in the vats for the yeast. The nuts, called ‘beechmast’, are edible, and were once widely used to feed pigs. The best Spanish ham still today comes from pigs allowed to forage naturally in beech forests. Natural forms of the Beech Tree are wonderful additions to a woodland area, and beautiful lawn specimens too. They need room, as mature trees can be 60 to 80 feet tall and almost as wide, so choose a planting spot carefully. Most weeping forms too will cover large areas in time, so give them plenty of room. It would be a shame to see grand old trees removed because they were planted with too little space. The exotic forms, with their unique foliage and habits, are best used as specimens, standing on display on a lawn, or among other small trees or large shrubs, and always place them carefully, so that their beauty can be fully appreciated. With their relatively small leaves, Beech Trees are also popular for Bonsai, and with training they make beautiful specimens for pots in Asian-style gardens. Beech Trees are large forest trees, growing to 50 to 80 feet tall, and trees 140 feet tall exist. When grown among other trees they will be more slender, and more upright, but grown as a specimen in the open they will form a broad, spreading crown eventually well over 50 feet across. The trunk is often very broad, giving a grand look to mature trees, and the smooth gray bark is instantly recognizable, and very attractive. Even on old trees it does not develop the deep furrows and plates seen on most trees. The bark is thin and easily damaged, leaving permanent scars. The leaves are simple ovals, 2 to 4 inches long, with narrowly-spaced veins, a pointed tip, and a finely-toothed edge. The leaf has a characteristic wavy look around its edge, and fine hairs, especially on the underside, when young. The young branches are slender and spreading, giving a graceful and elegant look to the tree. Every beech tree has both male and female flowers on it, which appear in April and May. The male flowers hang in catkins, and the female flowers in pairs, sitting in a small cup. The trees are wind-pollinated and in fall the beechnuts develop, usually two together, wrapped in a prickly covering. These fall naturally to the ground in late fall. Beech Trees grow best in deep, rich soils, and they are not particularly drought-tolerant. They can be grown in zones 4, 5, 6 and 7. Trees in zone 4 should be planted with shelter from cold winds. The do not grow well in hot and humid conditions, or in dry climates. They also do not grow well in wet soils, so choose a higher part of your garden, digging and enriching the soil before you plant. This tree is tolerant of a wide range of soils, other than very wet or very dry conditions. The European Beech is superior to the American Beech for planting in urban areas. American Beech is best for native planting and natural areas, although it is slower growing, and needs some patience before becoming a good specimen. Mulch young trees in spring with rich organic material, and water newer trees regularly, until they are well established. Keep mulch a few inches from the trunk, but over the root zone. Besides feeding your trees and conserving moisture, this will protect the delicate bark from damage by mowers and trimmers. Pests and diseases are uncommon, and besides moisture no special care is needed. It is usually not eaten by deer. If grown as a hedge, trim in late winter, while still dormant, and again in early summer, once the spring growth matures. Although there are about 10 species of beech trees, found growing in Europe, Asia, Japan and North America, they are all very similar to each other in appearance. The early settlers brought the European Beech with them in the mid-1700s, and this is the tree seen widely planted across America. Europeans, particularly the British, love Beech Trees almost above any other tree. Beech forests grow from Norway to Italy, and in France 15% of forests are Beech. The tree is also grown in Spain, and it is an important part of natural forests across Europe. 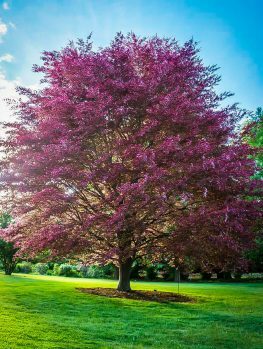 The European Beech is a large tree, most notable for the varieties available, which bring unique colors and forms to our gardens. 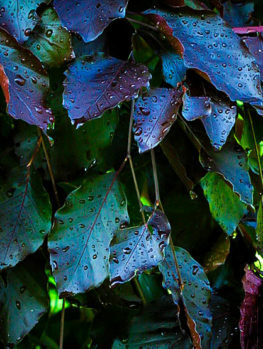 Trees may have different leaf coloring, most commonly dark purple. As well the form of the tree can vary from narrow, upright trees to completely weeping forms, in both green and colored foliage. These trees are widely grown in gardens, for the beauty of their foliage. Instead of being green, the leaves in spring and summer are bronzy purple to dark, almost black, purple. In fall they turn coppery, which is why these trees are often called copper beech, as well as the more obvious name of purple beech. These striking and dramatic trees are wonderful as specimens on a lawn, or to create a focal point in your garden, perhaps in a corner, or among other special trees. ‘Rohanii’ – This unique tree, developed in Bavaria around 1894, not only has purple leaves, but the leaves are lobed, rather like an oak tree. It is tall growing, with a slightly narrower form, especially when young. ‘Purpurea Tricolor’ – This is perhaps the most visually spectacular of all the colored beech trees. It grows into an upright tree, 20 to 30 feet tall, and 10 or 20 feet wide. 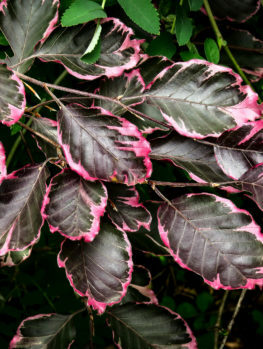 Also known as ‘Roseo-marginata’, it has purple color on a variegated leaf, which creates spring and early summer foliage that is a vibrant and dramatic purple pink, turning more purple in summer, and bronze in fall. This stand-out tree is simply gorgeous, and it packs an amazing visual punch. There are several varieties with narrow, upright branches, which are excellent for accent specimens and for smaller spaces (although they still become large in time). ‘Dawyck’ – This upright form has a long history, dating back to England in the early 19th century. The leaves are green. 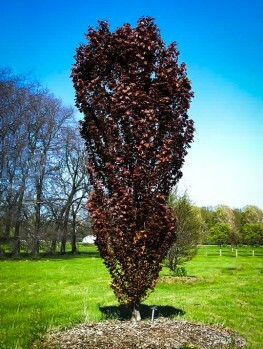 ‘Red Obelisk’ – This tree is a cross between ‘Dawyck’ and ‘Rohanii’, which produced a beautiful narrow tree reminiscent of a Lombardy Poplar. 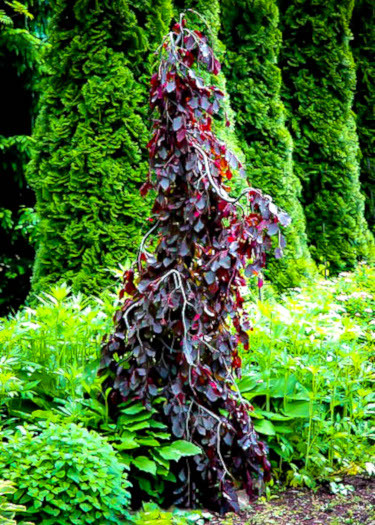 The foliage is a rich purple color, and the tree can grow 40 to 60 feet tall but remain just 3 to 5 feet wide. It makes a wonderful specimen in a smaller area, and it is also perfect for a unique screen or informal hedge, planted at 3 or 4-foot centers for a tight screen, or 10 feet apart for an avenue. Trees with pendulous branches always attract attention, and a mature weeping beech is spectacularly beautiful. There are two main forms of weeping beech. One has a broad crown, with spreading main branches and drooping side branches – a graceful form. Other trees have a tall central trunk, with main branches growing out horizontally, and then drooping dramatically. 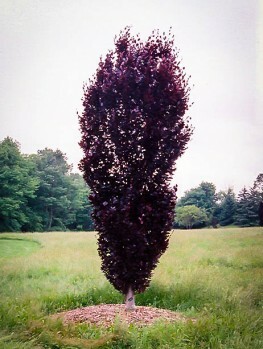 ‘Purple Fountain’ – This particularly handsome tree is a smaller form of the ‘central trunk’ weeping type, with the addition of purple foliage. Together they make for a powerfully beautiful specimen tree. Discovered in the Netherlands in the 1960s, it is smaller too, and so ideal for today’s gardens. It grows no more than 30 feet tall, with a width of 10 to 15 feet. The drooping branches fall like a curtain to the ground, even trailing along it. 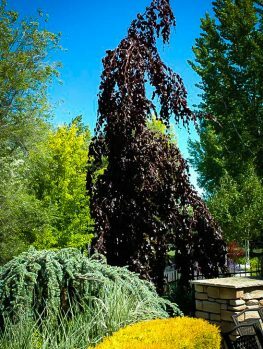 This tree is perfect by a pond, or on a lawn, and it becomes a stand-out specimen tree. Although a native tree, growing in forests throughout eastern North America, this is a more difficult tree to grow than the European Beech. It is not so tolerant of urban conditions, and it does best in deep, rich soils that are moist but well-drained. Growing large, it is best kept for natural settings in woodlands.